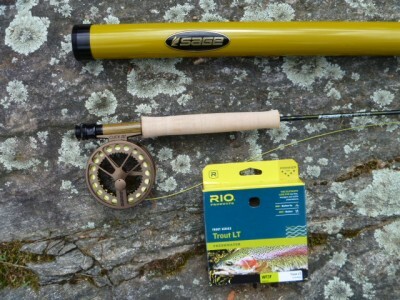 For the past few weeks I’ve had the Sage CIRCA 379-4 fly rod, Sage Click III fly reel and RIO Trout LT WF3F line sitting in my closet waiting to be used on a trout stream. Due to the heavy amount of rain that we’ve received, the rivers have been too blown out for any small stream trout fishing. My only test of this combo was on a local pond filled with bass and bream. To see my review of that trip, click here. 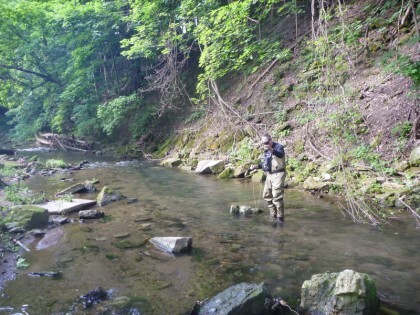 It did a fine job, but to really give it a fair test it needed to be used on a trout stream. Luckily, the water levels returned to normal, so I took the rig to the Pootatuck River. The Pootatuck has both stocked and wild trout. It fishes like a small stream – well canopied, 20′ to 30′ wide and water less than knee height. It has small pockets and runs – perfect for a 3wt. I chose a section between two high canyon walls with cool temps and plenty of moving water. My first attempts with a caddis dry were met by eager fingerlings, but none could manage to take the fly. 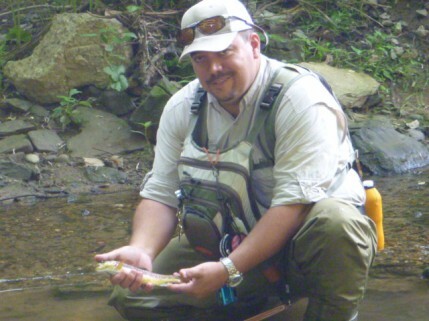 Moving upstream to a nice run below a waterfall yielded this feisty brown. The Sage CIRCA performed as expected, once again delivering the promised slower action without sacrificing accuracy. I was limited on the ability to backcast, but had no problem getting line out. 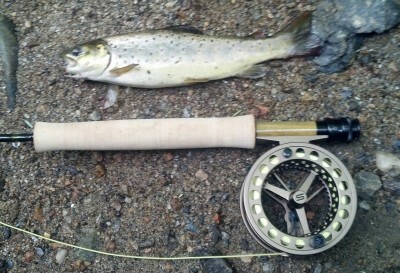 When a trout did bend the rod, there was no question of its ability to hold the fish. Twice I had a 12″ rainbow on the line. Unfortunately he broke off on the first try and escaped just short of being landed the second time, a risk you take when going barbless. Even with a fish of this size, the rod bent fully without feeling stiff or weak. Since I didn’t have a lot of room to strip line, I brought the brown in on the reel. The Click III reel was smooth while retrieving line and did not hesitate or vibrate when I decided to let the brown run before bringing him in. 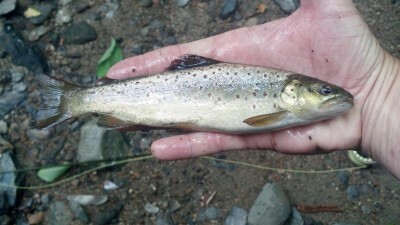 I also had a better chance to evaluate the RIO Trout LT WF3F line. 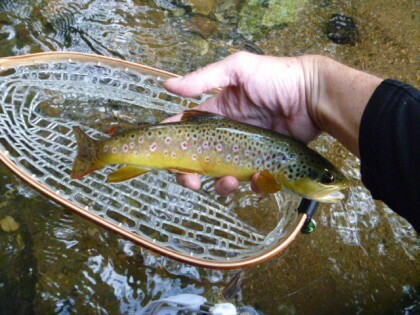 It is easy to work with on stillwater and also impressive on a small stream. The long front taper allows for the softer presentation needed for dries, and the line is supple enough to mend and form in small areas. I still think the best part of this combo is how light and responsive it is. And as I said in my earlier post, although they probably had trout in mind when they designed the CIRCA rod, it is an excellent for bream as well. If you’re looking for a rod, reel and line for small stream trout (and some panfish) the Sage CIRCA fly rod, Click III reel and RIO trout LT line will not disappoint. Enjoy! Note: I receive no compensation for these reviews. Spent a few hours on Sunday small stream fishing with my friends Fredy and Johnny from the Ridge and Valley TU Chapter in northwestern New Jersey. For most of the morning we followed a relatively small stream filled with spooky native browns. This was true target casting. A wrong move or sloppy presentation could cause the fish to scatter or put them down for several minutes. Luckily both are great anglers and possess the skill and patience required for this type of fishing. I was surprised that such skinny water could hold reasonably large fish. Rarely was I above my knee in the water, and most of the time it was ankle deep. Both Fredy and Johnny had multiple hookups, and I was able to bring in the brown below on a blue wing dry. They also did a better job of keeping their flies out of the trees, an enviable practice that eluded me. I’m sure that I provided them with comic relief. It was tough fishing, but well worth the additional effort required to catch beautiful wild browns and to test my casting skills. Thanks to Fredy and Johnny for sharing this great stream with me. For those of you who tie, Johnny has a great fly tying site, Utah’s Fly Corner. Check it out if you get a chance. Enjoy!